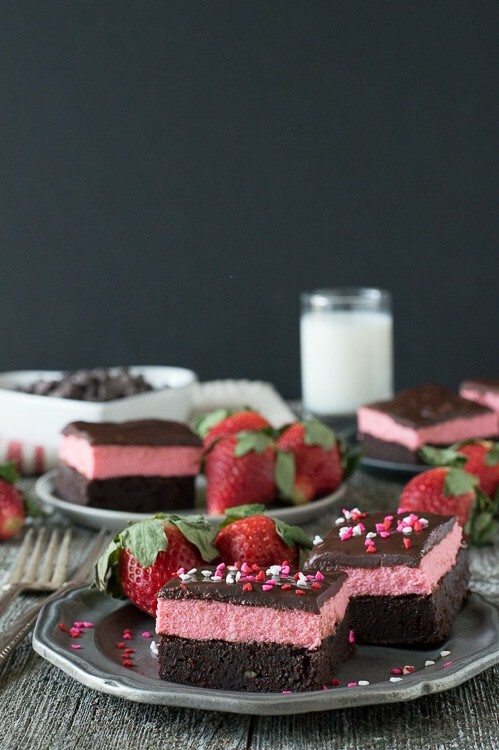 Layered Strawberry Mousse Brownie Recipe – a rich chocolate brownie topped with strawberry mousse and chocolate ganache. A favorite for Valentine’s Day! I am very thankful that Valentine’s Day is not all about the color yellow. Wouldn’t that be awful? Don’t get me wrong, lemons are yellow and I love citrus, but Valentine’s Day requires chocolate, and lemon wouldn’t be the first thing I’d pair with chocolate. 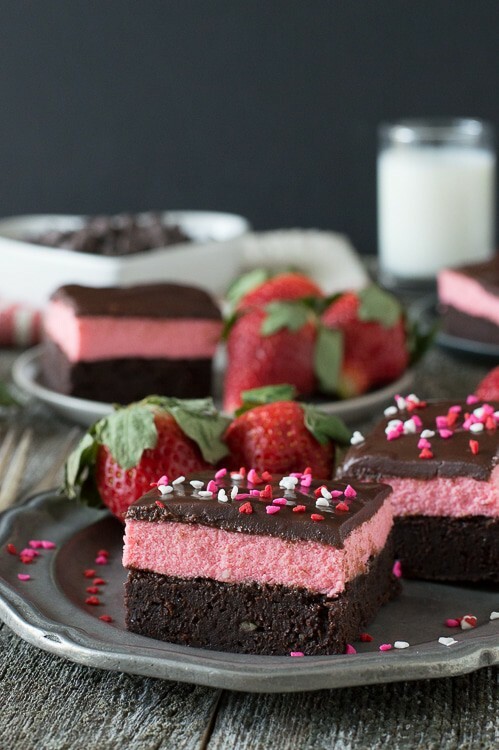 Just imagine, if Valentine’s Day was about the color yellow, these mousse brownies would look like bumblebees. And you don’t want your sweetie to associate bumblebees and stingers and pain with the most lovey dovey holiday. What about these valentine’s day donuts – what if they had yellow frosting instead of cute shades of pink? I think your eyeballs and mine would hurt from looking at that much yellow. So thank you Hallmark (er, I mean Cupid..) for making Valentine’s Day all about pink and red. And purple, light pink, dark pink, dull pink, and white. There are 3 things that this recipe calls for that you might not typically have on hand. 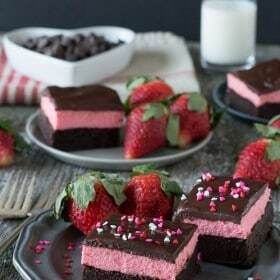 You need one gelatin packet, strawberry extract, and valentine’s heart sprinkles. I will help you justify these purchases..
Gelatin packets: They are used when making some homemade mousse recipes, in homemade marshmallows, and can be used to make your own homemade jello cups. 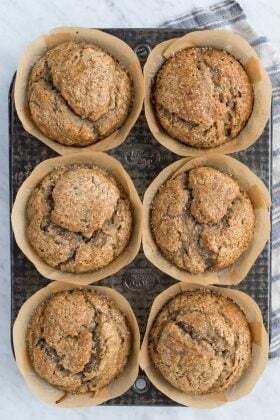 They can sit in your pantry for a while and will be okay to use. 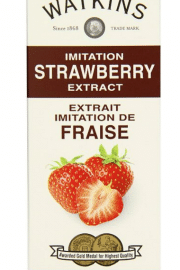 Strawberry Extract: This is a fun imitation extract to have on hand if you like the flavor of strawberries. You can use it to flavor anything, like frosting or fudge. Valentine’s heart sprinkles: They are so cute and come in handy when wanting to give any dessert some extra love. 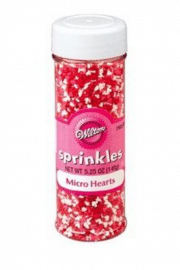 In my mind sprinkles never expire, so buy a container of heart sprinkles this year and use them for the next couple of valentine’s days. But if your sprinkles smell rancid or are wet, then it’s time to buy new ones. Baking Tip: To achieve clean cut lines I wipe my knife on a paper towel or dry wash cloth after each cut. I like to call this “the it will drive you crazy but you will have perfectly clean cut lines” method. 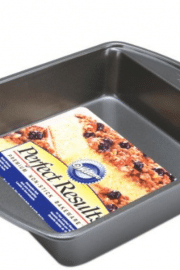 Preheat the oven to 350 degrees F. Line a 8×8 inch pan with foil or parchment paper, so that foil extends up and over the sides, and spray the foil with nonstick cooking spray. Place the butter, sugar, cocoa powder, and salt in a saucepan set over medium-low heat. Warm the mixture, stirring frequently, until the butter melts and the mixture becomes grainy. Take the pan off the heat and let it cool for 5 minutes. Add the vanilla extract and eggs one at a time, whisking well after each. As you add the eggs the mixture will go from being grainy to a shiny. Finally, add the flour and fold it in gently until no streaks of flour remain. Scrape the batter into the pan and bake for 15-20 minutes, until a toothpick in the center comes out clean. Let the brownies cool completely in the pan. If preparing them the day before, be sure to cover them overnight. In a small pot, over low heat, combine the white chocolate chips and 1/4 cup of heavy cream. Allow the mixture to melt, stirring occasionally. This may take up to 8 minutes. While you wait for the white chocolate mixture to cool, prepare the gelatin. Whisk together the gelatin and the cold water in a small bowl, and set it aside to let the gelatin absorb the water. 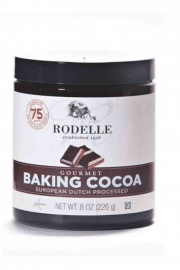 When the chocolate is at room temperature, microwave the bowl of gelatin for 10 seconds, until it is melted. Whisk the melted gelatin and white chocolate together. Add the strawberry extract, and several drops of red food coloring. The color should be a little more intense than you want the final mousse color to be, because it will lighten as you add the whipped cream in the next step. Whip the remaining 3/4 cups heavy cream to firm peaks in a separate bowl. Fold the whipped cream into the chocolate. 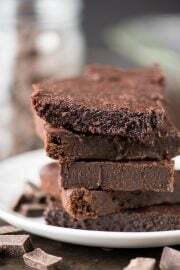 Using a spatula, spread the mousse onto the cooled brownies into a smooth even layer. Refrigerate for 30 minutes before adding the chocolate glaze. In a small pot, over low heat, combine the chocolate chips and heavy cream. Allow the mixture to melt, stirring occasionally. This may take up to 4 minutes. Evenly pour the chocolate ganache over the mousse layer. Refrigerate the brownies to set the mousse and glaze for at least 1 hour. Once set, remove the brownies from the pan using the foil or parchment paper. Cut and enjoy. Haha you’re right! Lemons would be THE WORST! 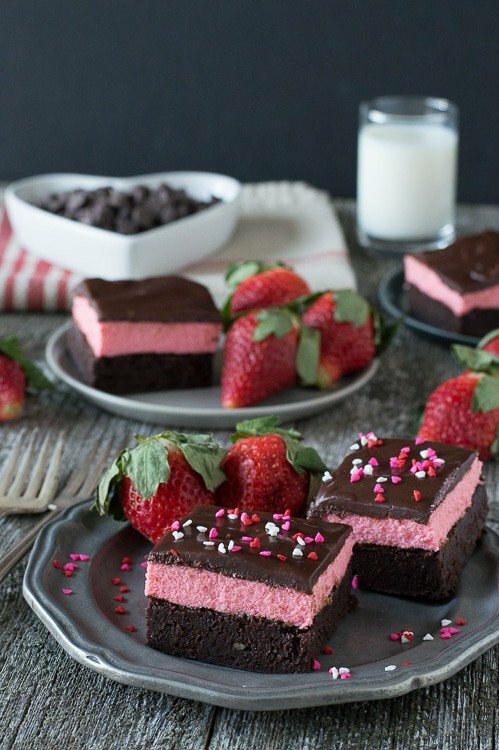 Definitely glad it’s strawberries, because then I can make these! Haha, lemon and chocolate would be no good. Lemon and white chocolate maybe! But yes, definitely a win with the red and pink fruits! And chocolate of course :) Pinned! Lemon and white chocolate is a good match, I didn’t think about that one! You convinced me! I’m heading out to get everything I need for these brownies. They are gorgeous just like everything else you make! Haha, I can’t imagine what it would be like if Valentine’s day was all about yellow! So glad it’s pink/red. 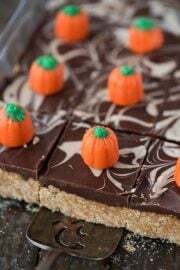 These brownies are totally a winner! Thanks for your sweet comment Lisa! I don’t know…I think some bumblebee brownies would be pretty cute! 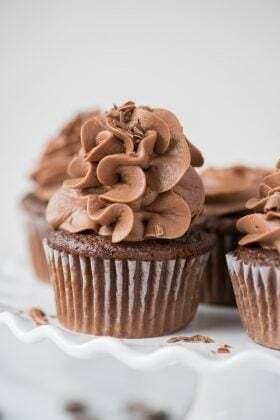 Maybe they would be filled with yellow buttercream but I do love the sound of brownies topped with mousse! bumblebee brownies definitely could be cute, for spring! I love these bars, they are so pretty! Every time I come here I drool. These look really beautiful. The mousse reminds me of the blueberry mousse I used to get at a local restaurant! I love blueberries, that sounds amazing Kacey! 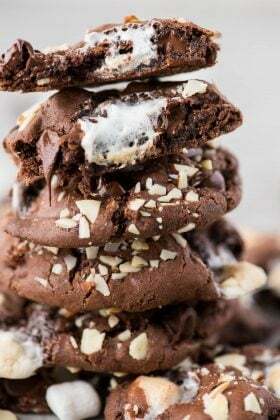 These are some of the most gorgeous brownies I’ve ever laid eyes on Beth – Pinned! SO gorgeous! I need that strawberry mousse in my life! I can’t wait for strawberry season!! Yellow is definitely good for Easter though! Ha, imagine if Valentine’s day was all about yellow – so funny to think about! These brownies are so gorgeous! 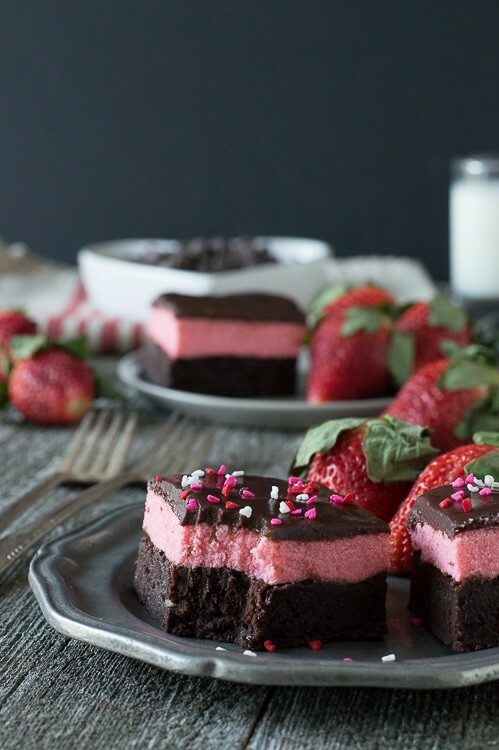 I love that layer of strawberry mousse – so pretty and delicious! Although yellow roses are pretty! Haha, you’re just like me Miranda! Oh my goodness, you are so sweet Olivia! 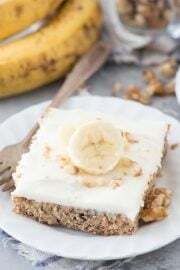 Heya, I just wanted to thank you for this recipe, I made it once for Valentines day, but recently I made it again for my cousins cancer benefit. We sold out! Also I don’t have strawberry extract, but both times I’ve made it I’ve used mio (you know the stuff that flavors water?) and the mousse has turned out lovely and I didn’t have to use much food coloring to get both a vivid pink and nice red. I’m going to try it again, and make it with blue lemonade. Thanks again! The Mio is a great idea! Thank you for sharing!